Osborne Concrete Co. is the only choice for honest prices on ready mix concrete with convenient delivery. You can also come to us for various other supplies, including a multitude of drainage piping options. Though we have made a name for ourselves with our reliable concrete delivery, our trucking services don't end there. While our concrete delivery is restricted to the immediate area (30 miles), our trucking services will go anywhere. 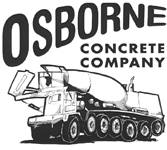 Learn about Osborne Concrete Co.
One of the most trusted names in Romulus, Michigan, Osborne Concrete Co. has been supplying the area with building supplies since 1965. Currently, it is the third generation of the original founder that still runs things. We take pride in what we do and provide outstanding customer service coupled with on-time deliveries. Contact our staff for any further information about our inventory of building supplies.